The convenience of a test strip, for most pool and spa tests. Scroll down to browse through information on Test Strips, for pool and spa use. Test strips are available for most of the common pool and spa tests and some, that are not everyday tests. Hard to beat, for convenience. The Website Store Directory contains an alphabetized listing of all products for sale. We don't just sell products. We help you make a better-informed choice, by providing all the information, you might require. Need ordering help? Scroll down the page, for the Order Desk Telephone Help Number. All items ordered will end up in the same shopping cart, no matter which page of this website, the items are located. All Major Credit Cards and PayPal are accepted. Order some today. Test Strips are available for the following test factors: Free and Total Chlorine, Bromine, pH, Total Alkalinity, Cyanuric Acid, Calcium Hardness, Borate, Phosphate, Biguanide Shock (Peroxide). MPS, Sodium Bromide, Nitrates, Copper, Iron and salt. Many test strips can perform multiple test factors and are suitable for use by pool and spa owners and pool and spa professionals. The right test can determine proper treatment, for many common pool and spa problems. Some test strips are available in Professional versions, to better suit the needs of pool and spa professionals. Test strips offer convenience and versatility. Choose from 10 models, for every pool or spa owner or professional need. No more color-matching or guesswork. Simple trilingual, pictorial directions. PockeTesters are electronic, dip and read testers, that can perform a variety of important tests: Salt, TDS, ORP, pH and more. WaterLink SpinTouch Labs are the ultimate Testers. Fast, Easy and Precise. 4 models: in-store, Mobile, Commercial or Drinking Water. Occasionally, issues arise that require a more specialized test: Manganese, Iron, Copper, Phosphate, Salt, Biguanide and Biguanide Shock We provide factory-fresh replacement chemicals and supplies, for every LaMotte tester, sold. for Pool and Spa use or other applications. Scroll down for Test Strips specifics and to place an order. • Insta-Test 3 Plus: Free Chlorine, Bromine, Total Alkalinity and pH. 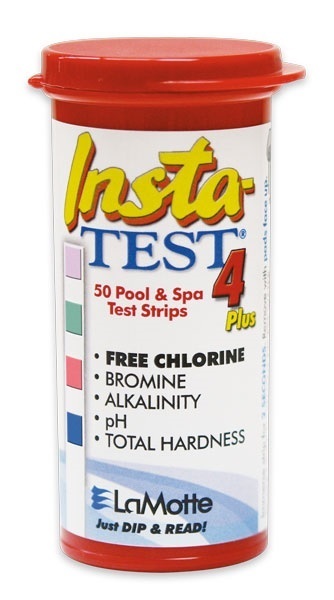 • Insta-Test 4 Plus: Free Chlorine, Bromine, Total Alkalinity, pH and Total Hardness. 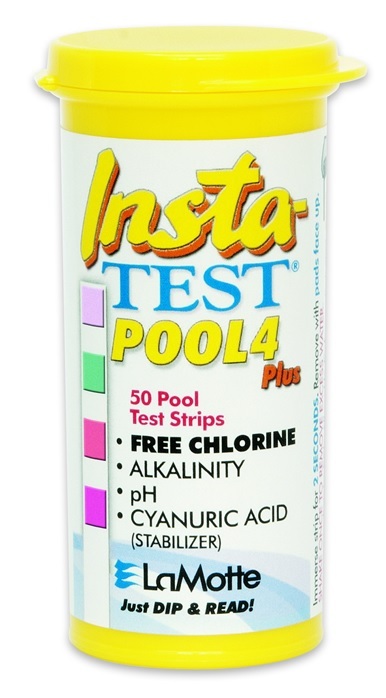 • Insta-Test POOL 4 Plus: Free Chlorine, Bromine, Total Alkalinity, pH and Total Hardness. 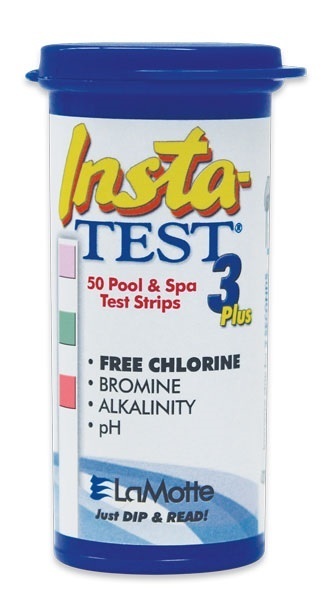 • Insta-Test 5 Plus: Free and Total Chlorine, Bromine, Total Alkalinity, pH and Hardness. 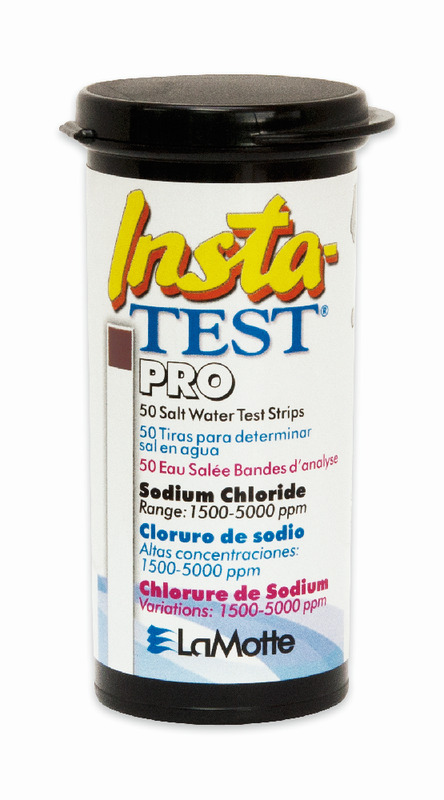 • Insta-Test 6 Plus: Free / Total Chlorine, Bromine, Tot. Alk., pH, Hardness and Cyanuric Acid. 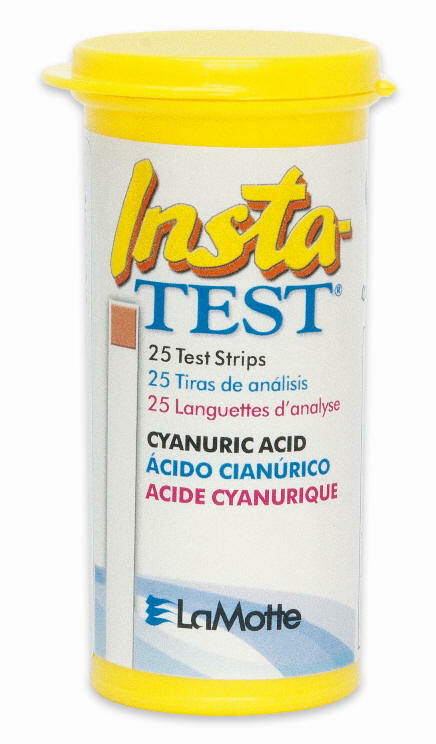 • Insta-Test: Cyanuric Acid (Chlorine Stabilizer) 0 - 500 PPM NEW!!! 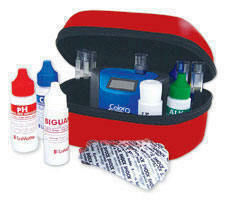 • Insta-Test Wide-Range pH and Total Chlorine: Measure well beyond the limits of testers. • Insta-Test Biguanide: Biguanide, Total Alkalinity, pH and Hardness. • Insta-Test Biguanide / Shock: Biguanide, Biguanide Shock, Total Alk., pH and Hardness. • Insta-Test: Peroxide (Biguanide Shock). • Insta-Test: Monopersulfate (MPS), pH and Total Alkalinity. • Insta-Test: Copper, pH and Total Alkalinity. • Insta-Test: Copper and Iron. 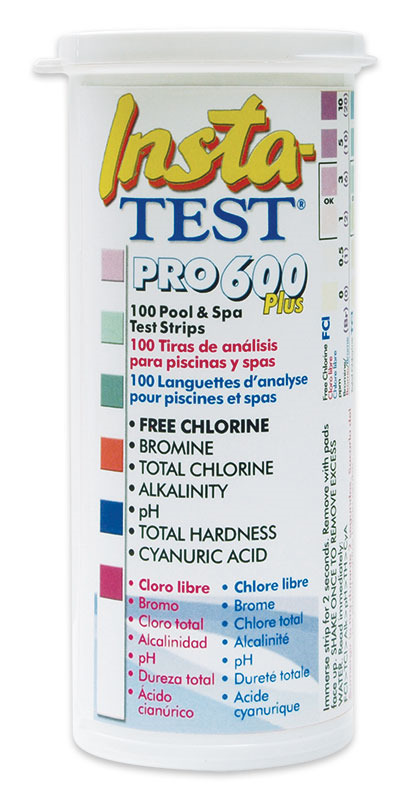 • Insta-Test PRO 600 Plus: Free / Total Chlorine, Bromine, Total Alk., pH, Hardness and CYA. Scroll down to review test strip options and place an order, of your choice. Insta-Test 3 measures Free Chlorine 0 to 10 ppm, Bromine 0 to 20 ppm, Alkalinity 0 to 180 ppm and pH 6.8 to 9.0 with instant results. Now with a 1-dip, shake and read formula, made possible by a new material used to fashion the strip. It prevents colors from bleeding, from pad to pad. Better results and reliability. Features a unique desiccant liner, to help protect the test strips against the effects of moisture. Better moisture protection and fast, reliable results make Insta-Test Strips the unbeatable test system. There are 50 strips per bottle, blister-carded with 12 units per case. Includes multilingual instructions: English, French and Spanish. Case of 12 units Cost: $68.20 cs. Click image to enlarge. All Major Credit Cards and PayPal are accepted. A single, convenient test strip that measures five (5) of the most important pool and spa water analysis parameters. Now with a 1-dip, shake and read formula, made possible by a new material used to fashion the strip. It prevents colors from bleeding, from pad to pad. Better results and reliability. 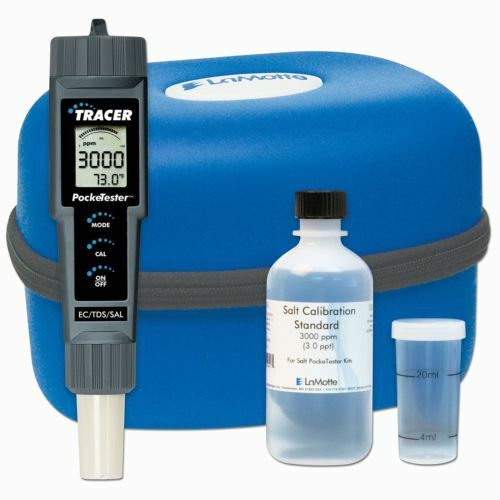 Measures Free Chlorine (0, 1, 3, 5, 10 ppm), Bromine (0, 3, 6, 10, 20 ppm), Total Alkalinity (0, 40, 80, 120, 180 ppm), pH (6.8, 7.2, 7.6, 8.0, 8.4, 9.0) and Total Hardness (50, 100, 250, 450, 800 ppm) in just 2 seconds. There are 50 strips per bottle, blister-carded with 12 units per case. Includes multilingual instructions: English, French and Spanish. If using the LaMotte Smart Scan System, order the Test Strip below. Case of 12 units Cost: $71.80 cs. Click image to enlarge. Everything ordered ends up in the same shopping cart. A single, convenient test strip that measures five (5) of the most important pool and spa water analysis parameters. Now with a 1-dip, shake and read formula, made possible by a new material used to fashion the strip. It prevents colors from bleeding, from pad to pad. Better results and reliability. 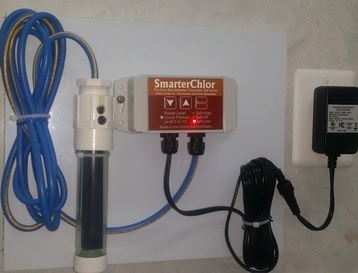 Measures Free Chlorine (0, 1, 3, 5, 10 ppm), Bromine (0, 3, 6, 10, 20 ppm), Total Alkalinity (0, 40, 80, 120, 180 ppm), pH (6.8, 7.2, 7.6, 8.0, 8.4, 9.0) and Cyanuric Acid (0-250 ppm) in just 2 seconds. There are 50 strips per bottle, blister-carded with 12 units per case. Includes multilingual instructions: English, French and Spanish. 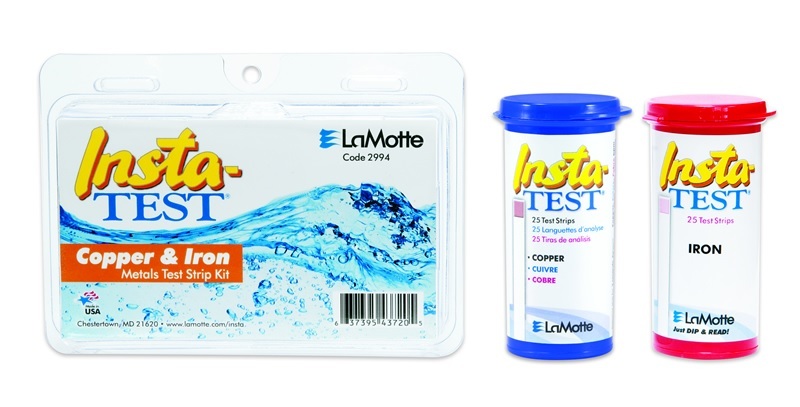 This Test Strip should be used with the LaMotte Smart Scan System. A single, convenient test strip that measures five (5) of the most important pool and spa water analysis parameters. Now with a 1-dip, shake and read formula, made possible by a new material used to fashion the strip. It prevents colors from bleeding, from pad to pad. Better results and reliability. Measures Free Chlorine (0, 1, 3, 5, 10 ppm), Bromine (0, 3, 6, 10, 20 ppm), Total Chlorine (0, 1, 3, 5, 10 ppm), Total Alkalinity (0, 40, 80, 120, 180 ppm), pH (6.8, 7.2, 7.6, 8.0, 8.4, 9.0) and Total Hardness (50, 100, 250, 450, 800 ppm) in just 2 seconds. There are 50 strips per bottle, blister-carded with 12 units per case. Includes multilingual instructions: English, French and Spanish. Case of 12 units Cost: $99.80 cs. 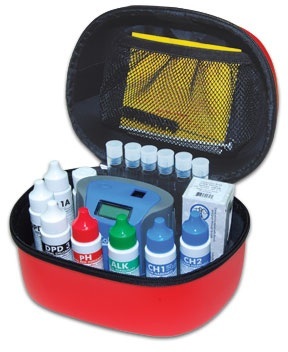 The #2056 ColorQ PRO 7 is one of several all-digital testers, that can perform all of the important tests, for pools using chlorine or bromine. Eliminate all the color-matching and guesswork. Use this link, for complete product and ordering information. 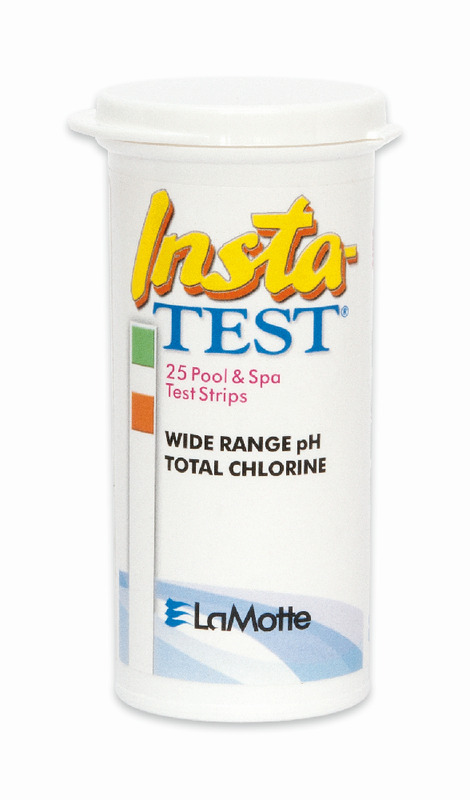 A single, convenient test strip that measures six (6) of the most important pool and spa water analysis parameters. Now with a 1-dip, shake and read formula, made possible by a new material used to fashion the strip. It prevents colors from bleeding, from pad to pad. Better results and reliability. Measures Cyanuric Acid (0 to 250 ppm), Free Chlorine (0, 1, 3, 5, 10 ppm), Bromine (0, 3, 6, 10, 20 ppm), Total Chlorine (0, 1, 3, 5, 10 ppm), Total Alkalinity (0, 40, 80, 120, 180 ppm), pH (6.8, 7.2, 7.6, 8.0, 8.4, 9.0) and Total Hardness (50, 100, 250, 450, 800 ppm) in just 2 seconds. There are 50 strips per bottle, blister-carded with 12 units per case. Includes multilingual instructions: English, French and Spanish. Case of 12 units Cost: $112.80 cs. NEW!!! A Cyanuric Acid (Chlorine Stabilizer) test strip, that tests over a range of 0 -500 PPM. Instantly, measures the stabilizer levels from 0, 40, 100, 150, 250, 500 PPM. Most pool testers will only read cyanuric acid levels up to 100-150 PPM. Therefore, a reading of 150 PPM could actually be much higher. When levels exceed 100 PPM, the effectiveness of chlorine decreases and water replacement is the most popular means of lowering a high level. There are 25 strips per bottle. Includes multilingual instructions: English, French and Spanish. Case of 12 units Cost: $92.90 cs. 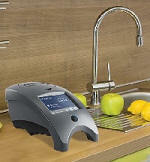 Measures the Total Chlorine level from 0, 1, 5, 10, 20, 50 PPM and the pH from pH at 4, 5, 6, 7, 8, 9, 10, in just 15 seconds. These strips do not provide precision results but go well beyond the range of popular pool and spa testers, on all types. They show approximately how far off conditions actually are, when standard testers are reading at the limits, of their testing ranges. These strips are packaged with 25 strips per bottle, in a 12-pack case. Item No. : 2987-G-12 Cost: $74.60 cs. 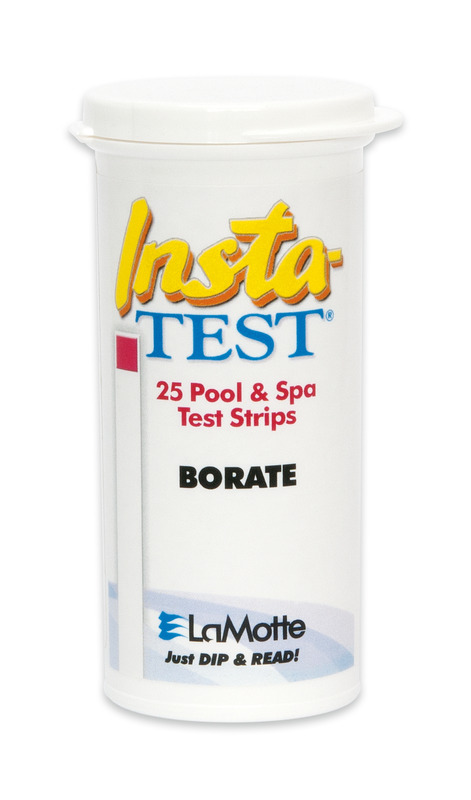 The Borate Insta-Test strips measure the Borate levels from 0 to 80 ppm. Get results in 15 seconds! Various products utilize borates, to help reduce chlorine consumption and inhibit algae growth. The Borate Insta-Test strips are packaged 25 strips per bottle, in a 12-pack case. Includes multilingual instructions: English, French and Spanish. Item No. : 3017-G-12 Cost: $74.90 cs. The Phosphate Insta-Test strips measure the levels from 0, 100, 200, 300, 400, 500, 1000 and 2500 ppb. Get results in only 15 seconds! Various products utilize lanthanum compounds to help reduce phosphate levels, in order to help reduce chlorine consumption and inhibit algae growth. Includes Test Tube and color matching chart. The Phosphate Insta-Test strips are packaged 25 strips per bottle, in a 6-pack case. Includes multilingual instructions: English, French and Spanish. Item No. : 3021-G-6 Cost: $82.20 cs. The NEW FORMULA, one-dip Biguanide test strip measures Biguanide (0–80 ppm), Alkalinity (0-240 ppm), pH (6.2-9.0) and Total Hardness (0-800 ppm). Designed for stable color development and allowing adequate time for the user, to match very distinct colors, while preventing cross-contamination between pads. There are 25 strips per bottle blister-carded with 12 units per case. Item No. : 2938-12 Cost: $74.80 cs. The NEW FORMULA test strip measures Biguanide (0–80 ppm), Biguanide Shock (0 to 360 ppm), Peroxide (0 to 100 ppm), Alkalinity (0-240 ppm), pH (6.2-9.0) and Total Hardness (0-800 ppm). Designed for stable color development, allowing adequate time for the user to match very distinct colors, while preventing cross-contamination between pads. There are 25 strips per bottle blister-carded with 12 units per case. Item No. : 2941-12 Cost: $92.90 cs. 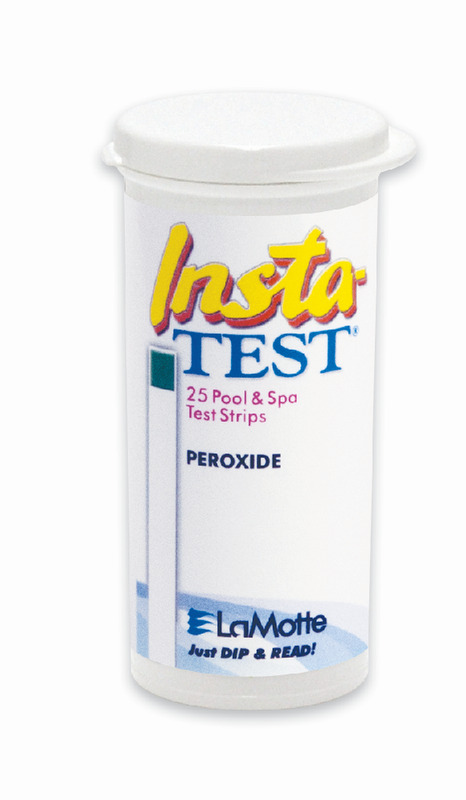 Peroxide Insta-Test strips measure the Hydrogen Peroxide (biguanide shock) level from 0 to 90 ppm in biguanide-maintained pools or spas. Color pads are present at 0, 15, 30, 50 & 90. with 30-50 PPM being ideal, when biguanide sanitizers are used. Get results instantly! The Peroxide Insta-Test strips are packaged 25 strips per bottle in a 12-pack case. Item No. : 2984-12 Cost: $74.80 cs. Monopersulfate (MPS) Insta-Test strips measure MPS in low, ok and high levels of MPS, Alkalinity 0 to 180 ppm, and pH 6.8 to 9.0. Get results instantly! MPS is also known as potassium monopersulfate, potassium peroxymonosulfate and non-chlorine shock. The Monopersulfate (MPS) Insta-Test strips are packaged 50 per bottle and are blister-carded, with 12 units per case. Includes multilingual instructions: English, French and Spanish. Item No. : 2982-ML-BC-12 Cost: $74.80 cs. The Insta-Test Sodium Bromide test strips can be used to determine the concentration present, in pools or spas, that are using bromine or have added a product containing sodium bromide. Measures levels from 1000, 1500, 2000, 2500 and 3000 PPM. Sodium bromide is useful in treating water mold and pink algae and for establishing a bromide reservoir. Get results, in just 20 seconds! There are 10 strips per bottle, with 12 units per case. Includes multilingual instructions: English, French and Spanish. Item No. : 3036-D-12 Cost: $66.40 cs. 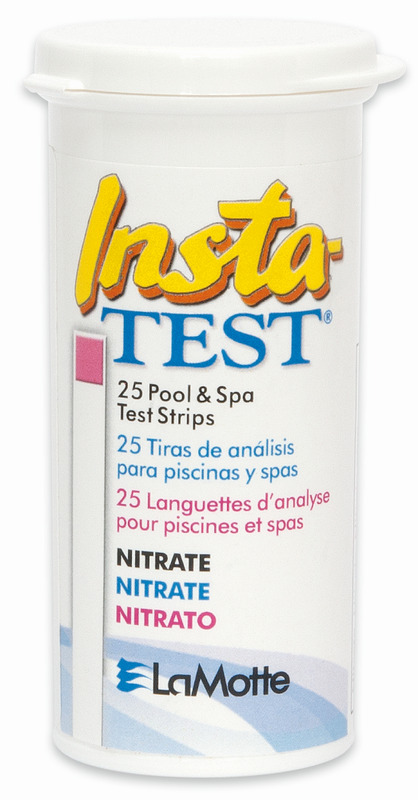 The Insta-Test® Nitrate pool and spa test strip measures Nitrate levels from (0, 10, 30, 60, 120, 200 ppm). The Nitrate test is a dip-n-read strip with results in 60 seconds. The bottle includes 25 strips packaged in a waterproof PopTop bottle with a trilingual (English, Spanish, French) instruction label. The PopTop bottle has a molded desiccant liner, which protects the strips from moisture and UV light. There are 25 strips per bottle, with 12 units per case. Includes multilingual instructions: English, French and Spanish. Item No. : 3012-G-12 Cost: $74.80 cs. 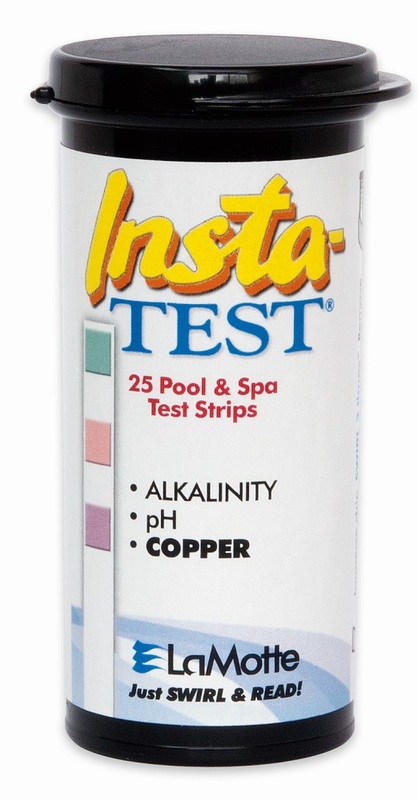 The NEW One-Dip Insta-Test Copper pool and spa test strip measures the total Copper levels from 0 to 3.0 ppm in just 15 seconds. The Copper test strip has been improved with a one-dip formula that offers very distinct colors. 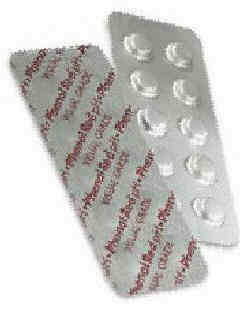 Packaged 25 strips per bottle with 12 bottles per case. The bottle includes 25 strips packaged in a waterproof PopTop bottle with a trilingual (English, Spanish, French) instruction label. The PopTop bottle has a molded desiccant liner, which protects the strips from moisture and UV light. There are 25 strips per bottle, with 12 units per case. Includes multilingual instructions: English, French and Spanish. Item No. : 2991-G-12 Cost: $74.80 cs. 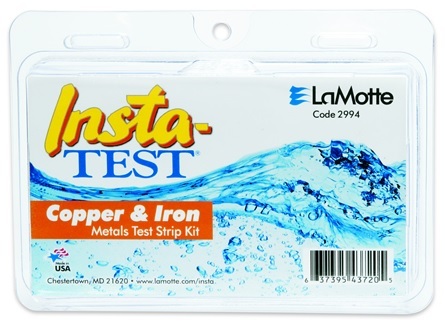 The Insta-Test Copper test strips can be used to determine the concentration present, in pools or spas, that are using a mineral sanitizer or ionizer or have copper present naturally or as the result of heater corrosion. The Copper test pad has been improved with a one-dip formula that offers very distinct colors. Measures copper levels from 0 to 3.0 PPM. 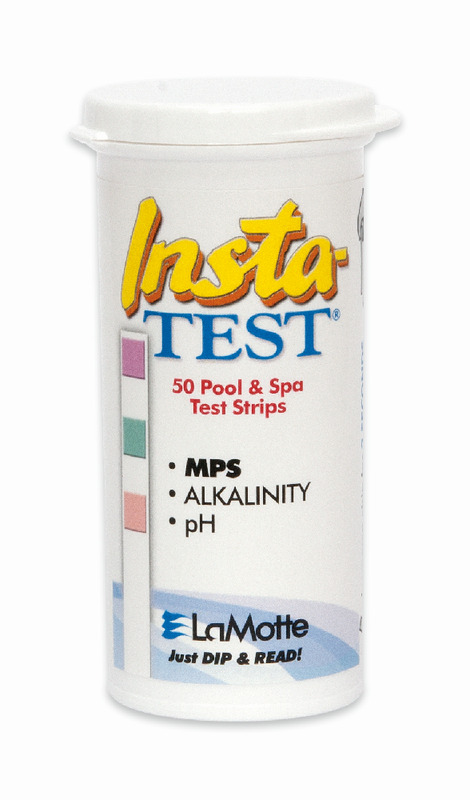 In addition, these test strips also test for pH (6.2 to 9.0) and Alkalinity (0 to 240 PPM). Get results, in just 10 seconds! There are 25 strips per bottle, with 12 units per case. Includes multilingual instructions: English, French and Spanish. Item No. : 3001-G-12 Cost: $88.60 cs. 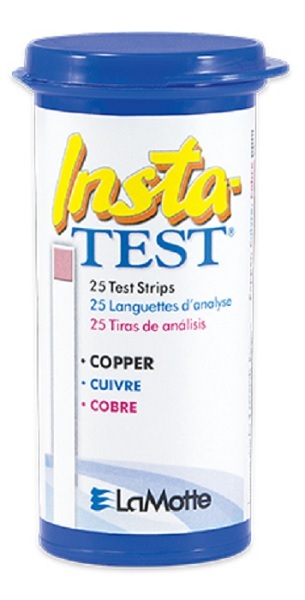 The Insta-Test Copper Test Strips Kit measures Copper levels from 0, 0.3, 0.6, 1.0, 3.0 ppm and Iron levels from 0, 0.3, 0.5, 1, 3, 5 PPM. The Copper test pad has been improved with a one-dip formula that offers very distinct colors. 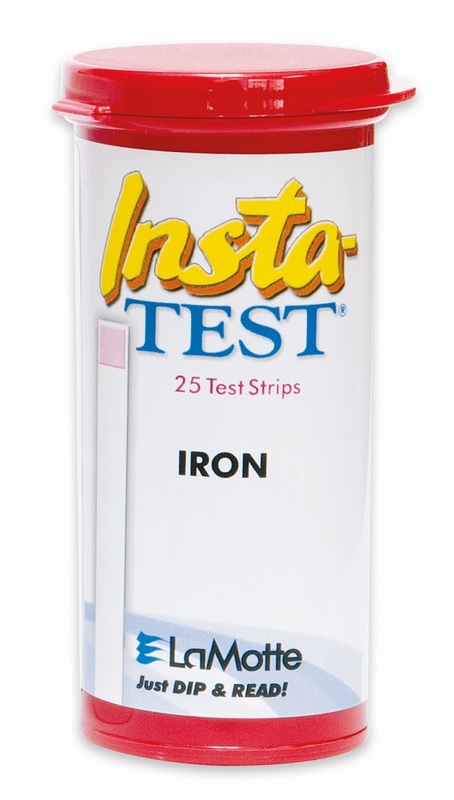 The Iron test strips unitize the new single dip technology and provide more distinct colors to match. Use it to determine, if a pool or spa, has an iron problem or to measure the copper level, provided by an ionizer or mineral sanitizer. Get results, in just 15 seconds! The Copper and Iron Test Strips Kit allows for 25 tests, for both copper and iron and are packed in cases of 6 kits. Item No. : 2994-6 Cost: $89.80 cs. The new one-dip Insta-TEST Iron test strip formula eliminates the need to pre-treat the sample with a reduction tablet prior to measuring Iron with a test strip. 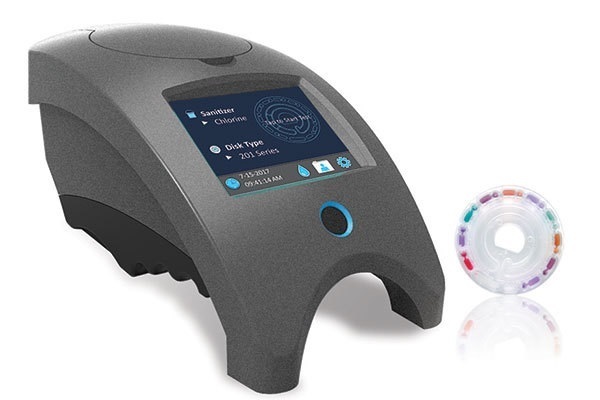 The Iron strip makes the testing process simpler, with just one dip of the strip into a pool or spa, before matching the reacted test strip, to a color chart (0, 0.3, 0.5, 1, 3, 5 ppm) on the bottle. Get results in 60 seconds. This one of a kind new test strip offers stable color development with very distinct colors. These strips, packaged in a unique, hinged, waterproof PopTop bottle with desiccant liner, which protects the test strips from the effects of moisture. Includes multilingual instructions: English, French and Spanish. Available in packages of 25 strips, in a case of 12. Item No. : 2935-G-12 Cost: $74.80 cs. A single, convenient test strip, designed specifically for on-site use by service professionals. Measures the most important pool and spa water analysis parameters. 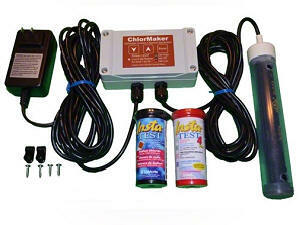 Measures Free Chlorine (0 - 10 ppm), Bromine (0 - 20 ppm), Total Chlorine (0 - 10 ppm), Total Alkalinity (0 -240 ppm) and pH (6.8 - 9.0). Get instant results! There are 100 strips per bottle, with 12 units per case. Includes multilingual instructions: English, French and Spanish. Item No. : 2978-12-PT Cost: $111.90 cs. A single, convenient test strip, designed specifically for on-site use by service professionals. Measures all of the most important pool and spa water analysis parameters. Measures Free Chlorine (0 - 10 ppm), Bromine (0 - 20 PPM), Total Chlorine (0 - 10 ppm), Total Alkalinity (0 -240 ppm), pH (6.8 - 9.0), Total Hardness (50 - 800 ppm) and Cyanuric Acid (0 - 250 ppm). Get results in 2 seconds! There are 100 strips per bottle, with 6 units per case. Includes multilingual instructions: English, French and Spanish. Item No. : 3028-J-6 Cost: $102.80 cs. This convenient Phosphate test strip is designed specifically for on-site use by service professionals. Measures phosphates from 0, 100, 200, 300. 500, 1000 and 2500 ppb, in just 15 seconds. Various products utilize lanthanum and other compounds to help reduce phosphate levels, in order to help reduce chlorine consumption and inhibit algae growth. There are 50 strips per bottle, with 6 units per case. Multilingual instructions are provided in English, French and Spanish. Item No. : 3021-H-6 Cost: $74.60 cs. This convenient Sodium Chloride (Salt) test strip is designed specifically for on-site use by service professionals. Measures salt from 1500, 2000, 2500, 3000. 3500, 4000 and 5000 ppm, in just 20 seconds. Maintaining the proper level of salt helps obtain optimum performance from salt chlorine generators. There are 50 strips per bottle, with 12 units per case. Instructions are provided in English, French and Spanish. Item No. : 2998-H-12 Cost: $115.80 cs. Makes the pool water come alive, eliminating dead zones, that promote algae growth. Graphic Mosaic Mats Just simply position on pool floor. Weighted to stay in place. Easy! Battery-Powered Leaf Vacuums are and easy way to clean all types of pools.